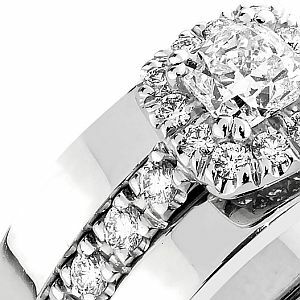 All Sandberg diamond jewels and engagement rings can be made to order in 950 grade platinum. The delivery time for platinum products is approximately 3 weeks. Platinum is the most valued jewellery metal. Regarding certain qualities it is indeed a better alternative than white gold, especially if the ring is intended for long-term use. Platinum’s own colour is very close to the pure white colour of rhodium plated white gold, having only a slightly darker or more “metallic” colour, which is why there is no need to rhodium plate platinum rings. Thus a platinum ring retains its colour although it would wear out in long-term use. Even a platinum ring can get scratched, but the scratches are less noticeable since the wear and tear cause no change in the colour of the surface of the ring. Platinum is also a very tough metal, thus platinum jewellery and especially delicate parts of jewellery are very durable. Platinum is heavier than even gold (density 21,45), and since the platinum alloy used in jewellery is almost pure platinum (95 % of alloy weight), a platinum ring is clearly heavier and contains significantly more precious metal than a similar ring made of white gold. This, combined with the fact that platinum is more difficult to work with, accounts for the fact that a platinum ring is more expensive than a similar white gold ring, although at the moment (February 2016) the world market price of gold is higher than that of platinum. Like gold alloys, also platinum alloy is supplied to us by K.A. Rasmussen Finland. The alloy consists of: platinum 95 % / copper 3 % / cobalt 2 %.